A seminar last year at Antalya Culture and Arts is crowned this year by the "Intellectual Practices of Photography" exhibition. Organized by Antalya Culture and Arts and Akdeniz University last year, the participants in the 10-week seminar "Intellectual Practices of Photography" have opened an exhibition to present projects they developed at the end of the seminar that lasts until tomorrow. 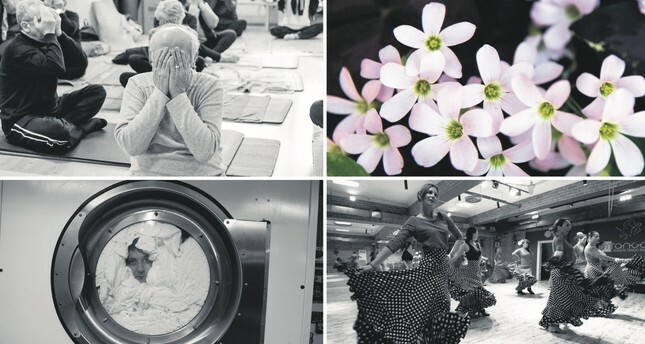 Akdeniz University Photography Department instructor Handan Dayı is the seminar director and adviser to the exhibition, which consists of four projects: "Yoga for Healthy Aging," "Laundry," "Dance" and "Antalya Flowers." Seminar participants Hakan Yaman, Mustafa Gümüş, Özgür Köroğlu and Şirin Adıgüzel create their works using new photography perspectives. Professor Hakan Yaman is an independent physician working in Antalya, and along with his acupuncture, phytotherapy, mesotherapy and hirudotherapy certificates, he has a Ministry of Tourism Professional Guide Cockade, a diving badge from the Turkish Water Sports Federation and a 1st Grade Yoga Instructor certificate from the Sports for Everyone Federation. Interested in art photography, documentary photography and street photography, Yaman is a member of ANFAD (Antalya Photography and Film Amateurs' Society), the Sille Art Palace and FIAP (Federation Internationale De L'art Photographique). More than 60 of his photographs have been exhibited at FIAP exhibitions in 15 countries and various mixed photo exhibitions and presentations. He is the first representative of Turkey in the Light Painting World Alliance. Mustafa Gümüş graduated from Mersin Atatürk Industrial Vocational High School in 1997. He has been interested in photography since 2010 as an amateur. His first solo exhibition "Seher ile Göç" (Migration at Dawn) on Yürüks (Sarıkeçili nomads) opened in 2013 in Antalya, and he continues work on nomadic life and culture and opened about 10 solo exhibitions, "On the Trail of Yürüks," at various galleries, including Istanbul Beyoğlu Art Gallery and Ankara Foundation Art Gallery. His work on nomads was exhibited at "10 Authors 10 Motifs" in Skopje, the capital of Macedonia. He has won prizes in national and international competitions, and while Gümüş continues to photograph the life of Yuruks, he is also involved in "Çadırın Çocuklarına" (To the Children of Tents), a social responsibility project and visits tents and gives gifts to the children of the tents received from volunteers at the "Light a Fire on Taurus Mountains" event, which has become a traditional event and is held for the fourth time this year. Özgür Köroğlu was born in Elazığ in 1975. He received his primary, secondary and high school education in Gaziantep and completed his university education in the Department of Electrics-Electronics at Karadeniz Technical University. He received his master's degree from the Ege University Solar Energy Institute in 2010, completed the Anadolu University Open Education Faculty's Photography and Cameraman Department in 2017 and Ataturk University, Open Education Faculty, Civil Aviation Management in 2018. He continues working as an electrical engineer and attends Akdeniz University, Faculty of Communication, Department of Journalism. He is also a tennis referee for the Turkish Tennis Federation and carries out theoretical, academic and practical research on photography while continuing various projects and shoots. Şirin Adıgüzel was born in 1973. As a small child, she defined her future plans and dreams with the words "mathematics, philosophy, painting and photography" and completed her university education in mathematics and her master's degree in philosophy. She also does oil paintings and is a mathematics teacher at Antalya High School.